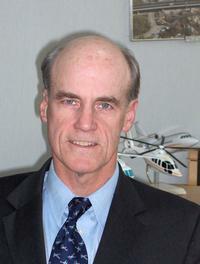 Bob Sheffield holds Commercial Airplane Single- and Multi-Engine -Land, and Instrument pilot ratings, and a Private Glider rating. Growing up in northeast Mississippi, his early interest in aviation was sparked at an airshow. He recalls, “A Navy A-4, I think, came up from behind the crowd – it was a total surprise and shock – and roared over. That intrigued me.” The boyhood fascination with flying was reinforced by the sonic booms of B-58 Hustlers flying from nearby Columbus Air Force Base. Scholarship money led to Mississippi State University for a degree in petroleum engineering, and to an ROTC commission in the Air Force upon graduation in 1972. Over the next 25 years, Bob Sheffield worked in nearly every aspect of the oil and gas exploration and production business in California, Louisiana, Michigan, Montana, New Mexico, and Texas. He earned Master’s degrees in petroleum engineering and business administration. In 1998, he assumed responsibility for all air and marine logistics operations in the Gulf of Mexico. Shell Aircraft Ltd. manages its global fleet under different arrangements. Though most helicopters are under contract from Bristow, CHC, PHI, and other operators, Shell Aircraft owns six EC155s operated in Nigeria by Bristow and flies its own three S-92s in Brunei. “We constantly review aircraft types in terms of their design, their equipment specifications, and their safety records, and list approved aircraft types for use by Shell companies,” explains Mr. Sheffield. The five-year average fatal aviation accident rate for members of the International Association of Oil & Gas Producers (OGP) has been just under seven fatal accidents per million flying hours. Flying about 100,000 hours annually, Shell Aircraft suffered no fatal air accidents from May 1995 to July 2002. However, one fatal accident in July 2002 and another in October 2003 raised the company’s fatal air accident rate to four per million flying hours. Challenging operations and environments led Shell Aircraft to a just, “generative” safety culture that maintains a state of constant unease. According to Mr. Sheffield, “With a state of constant unease, you’re always asking what could go wrong.” However, in contrast to punitive measures that suppress safety concerns, “We want to reward and recognize those people who report on incidents.” The generative culture aims at an informed workforce aware of risks and the best practices for managing them. Shell was a leader in Health and Usage Monitoring Systems (HUMS) for helicopter operations. The company invested in early HUMS for Bristow Super Pumas. The UK CAA found HUMS at the time successfully identified 67% of incipient failures before flight. “Even if it’s right only two-thirds of the time, that’s what I’d want on my aircraft,” says Mr. Sheffield. Today, 70% of the Shell fleet worldwide and virtually all its aircraft in high-exposure areas have HUMS. Least costly of Shell’s seven safety measures are disciplined takeoff and landing profiles that minimize the consequences of engine failures. To avoid risk, pilots seek the safest height/velocity profile rather than just “pull and go,” Bob Sheffield observes, “It’s just a training issue. The data is available from the manufacturers.” Landing approaches are likewise planned to avoid obstacles if an aircraft suffers a sudden loss of power.